Churn includes ARR reductions from customer cancellations, as well as reductions in revenue from continuing customers due to pricing decreases, usage decreases, or service downgrades (e.g. cancelling a premium feature). New ARR includes revenue from new customers and incremental revenue from continuing customers due to price increases, usage increases, and service upgrades. Applicable business context: The Churn Equation is applicable to month-to-month and periodic renewal business models. Use: Early-stage SaaS organizations often focus on net growth. However, focusing solely on net growth can obscure high churn rates, creating a longer term business risk. The Churn Equation disaggregates net growth, exposing the sources of new business and business losses. 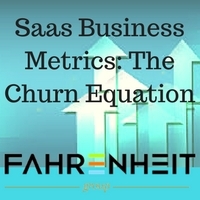 Monthly measurement and reporting of the Churn Equation and its underlying components provides insight into the performance of the account management, customer support, and development functions as these organizations play a central role in minimizing churn. Churn rates above 10% may signal customer expectation gaps, a deteriorating user experience, reliability and customer service issues, pricing pressure, or other challenges. If your company’s scale is outpacing your processes, which in turn is causing growing pains, regular fire-drills, and reduced profitability, The Fahrenheit Group has professionals who can help. We understand your industry and your challenges and are experienced in working closely with management to drive your business to the next level of success. Please contact us and find out how we can help. Jonathan Kelley is a professional within our Finance and Advisory practices. He is a versatile finance professional specializing in providing finance and operations leadership to SaaS / PaaS, enterprise software, and services clients. He can be contacted at jkelley@fahrenheitadvisors.com or 919-523-2102.